As you can probably tell by my some of my recipes (like my Pina colada overnight oats and almond colada smoothie), I am all about the tropical vibes and pina coladas. Nothing beats that taste and smell of pineapple and coconuts in the summertime. Sometimes I just want to whip up a pina colada just so I can smell it. Is that weird?? It just reminds me of sitting on the beach soaking up the sunshine and sipping on a nice cold beverage. ANYWAYS, that’s enough day dreaming. This mama ain’t getting to a tropical beach anytime soon…. Since we’ve had a few smoking hot days here lately, I haven’t really been in the mood for using the oven, so I’ve been experimenting more with the good ol’ no-bake recipes. 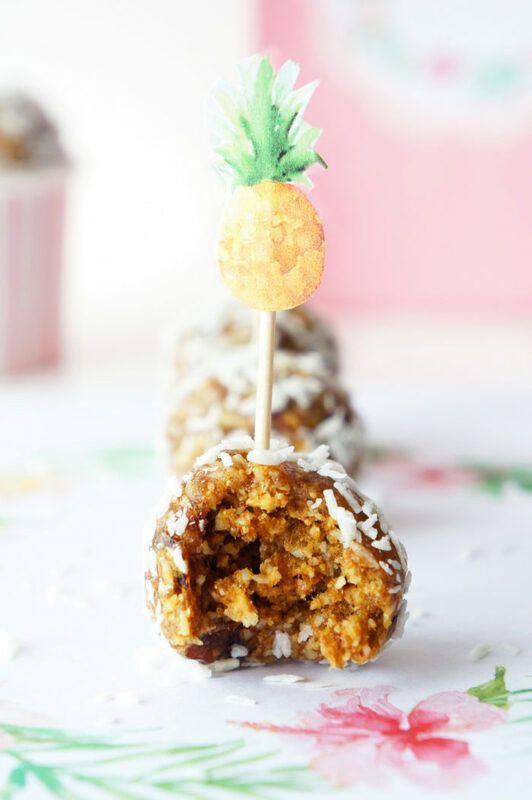 One day, when I was craving pina coladas, I got inspired to whip up some of these no-bake pina colada energy bites! These little balls of goodness did not disappoint. My family was over visiting last weekend, and by the end of the weekend, they were GONE. Clearly, I wasn’t the only one craving a tropical bite. You can whip up a batch in less than 20 minutes. They are a source of fibre, healthy fats, and protein, which makes for a filling and healthy snack or treat. You can freeze them, so they make for a really quick and easy snack on the go. They are just plain DELICIOUS! Feel free to insert your own reasons for LOVING energy bites here ________! 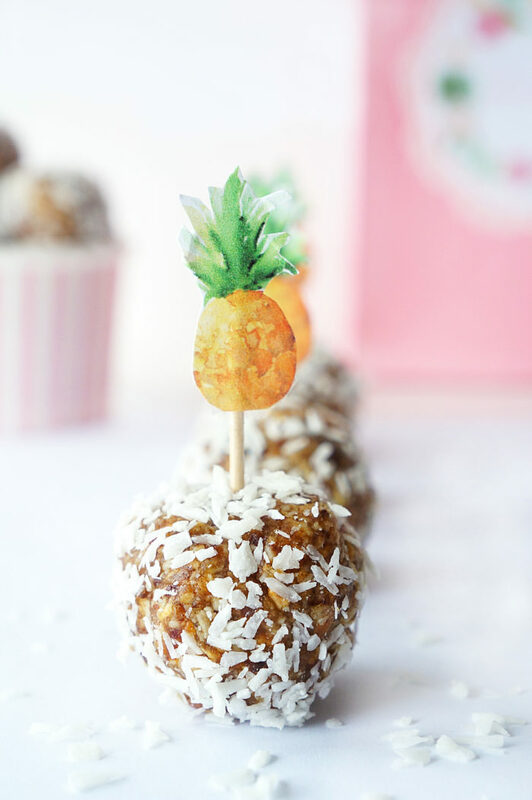 If you’re serving these bites up for a party, I recommend using some cute little pineapple topper toothpicks or you can use my free printable ones here! Just cut them out and tape or glue them to a toothpick! 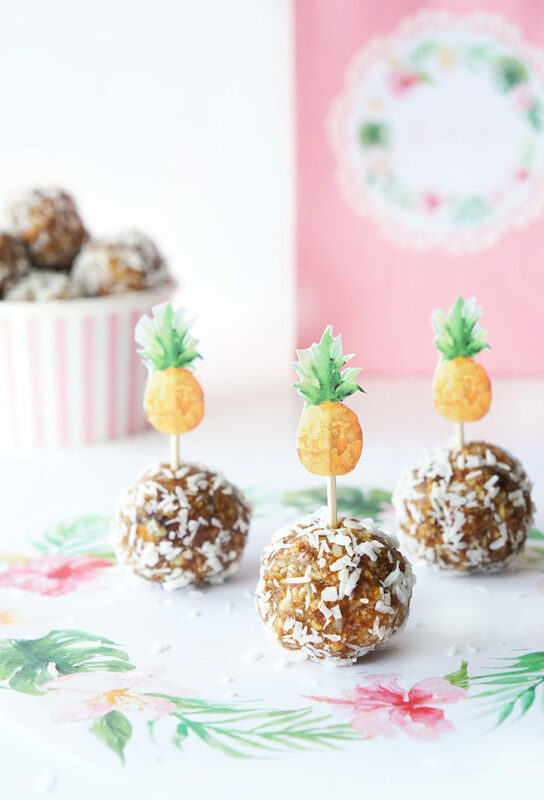 Or serving them on a cute pineapple plate would also be a nice tropical touch! 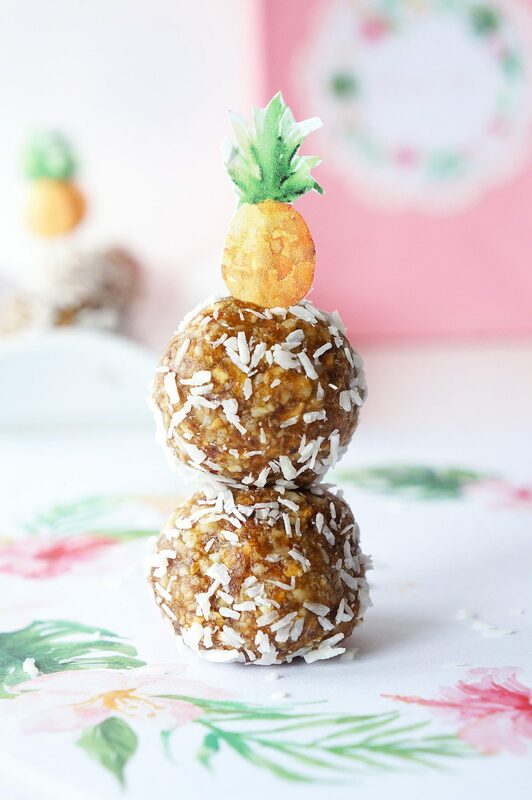 These no-bake pina colada energy bites are filled with tropical flavours that will remind you of pina coladas on the beach. 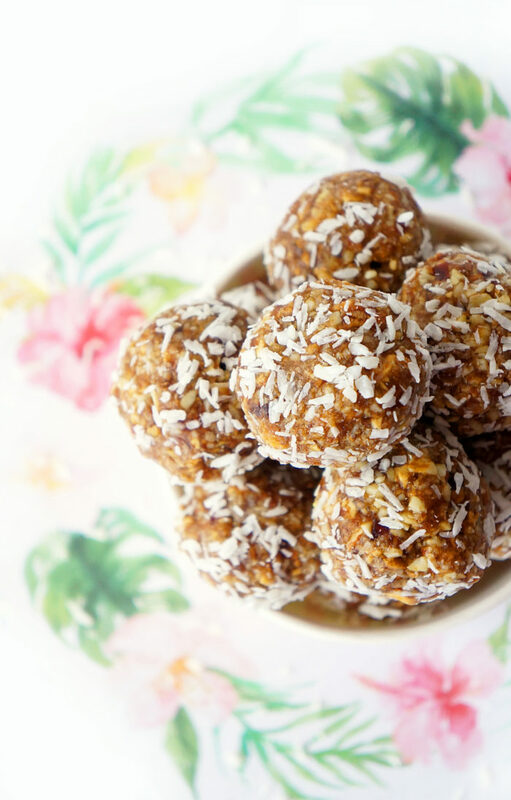 Packed full of fibre, healthy fats and protein, they make a healthy and tasty snack or treat. Make up a batch and freeze for a quick and easy bite on the go! Soak dates in boiling water for 5 minutes to soften. Add almonds, cashews and coconut to food processor and pulse until nuts are finely chopped but not a paste. Add dates and dried pineapple and pulse until finely chopped and the mixture starts to clump. You may need to add a bit of water to help the mixture bind together. 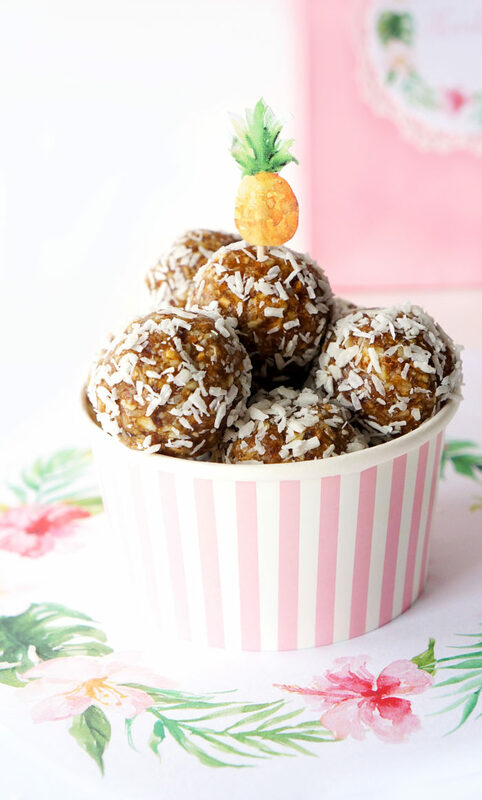 Shape the mixture into 1-inch balls and roll in additional coconut. Store in a container or ziplock bag in fridge or freezer. I totally hear you! I love making pick-me-up snacks all the time. These sound great and I just love the toppers! Very cute. I’m making small treat boxes for friends and including these in both a rum infused and this version ball. I will let you know how they come out, hopefully as lively as yours. If not, I will just say I am guilty of testing the product too much. I love that idea Dayna!! Such a great gift! Hope your friends enjoy the treats!